A man and a woman in white suits are walking along the field with wheat. on a sunny day, romantic date. 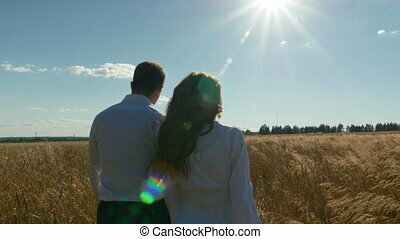 A Man And A Woman In White Suits Are Walking Along The Field With Wheat. A man and a woman in white suits are walking along the field with wheat. 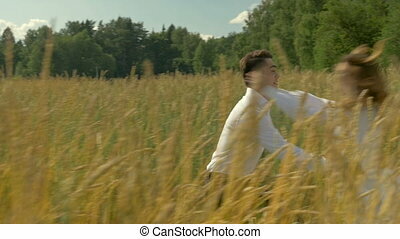 On a sunny day, in a field with wheat. Romantic date. 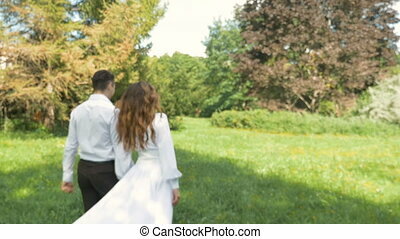 A young woman and a man in white suits are walking in the park. Romantic date. The camera moves around the pair. A young woman and a man in white suits are walking in the park. Hold hands, in the blur zone. Romantic date. A young woman and a man in white suits flee to meet each other and embrace. On a sunny day, in a field with wheat. Romantic date. A beautiful couple in white suits hugs on a date. Romantic relationship. They are happy, laughing and looking at each other. Slow motion.